A new New Town friend and I decided to have a Pumpkin Pinterest Party at my house and it has been so much fun planning the event. I have been buying pumpkin goodies for the guests and have started making some yummy treats. I make the Pumpkin Cheeseball by Tastefully Simple. I also made their Pumpkin Beer Bread in muffins. Both are very easy and very delicious. I love easy and delicious! I purchased Pita Chips with pumpkin seeds from Trader Joes to go with my cheeseball. These chips are pretty and delicious. Perfect pairing with my pumpkin cheeseball. At World Market I found pumpkin salsa and black and orange tortilla chips! The salsa is a bit sweeter than regular salsa but there is definitely a little kick to it. I made tiny pumpkin tarts using the prebaked shells and instant pumpkin pudding. I made the pudding with less milk to make it thicker. I topped it with candied bacon, just a smidge. One of our neighbors has a vinyl business and made monograms for some of us to put on pumpkins. 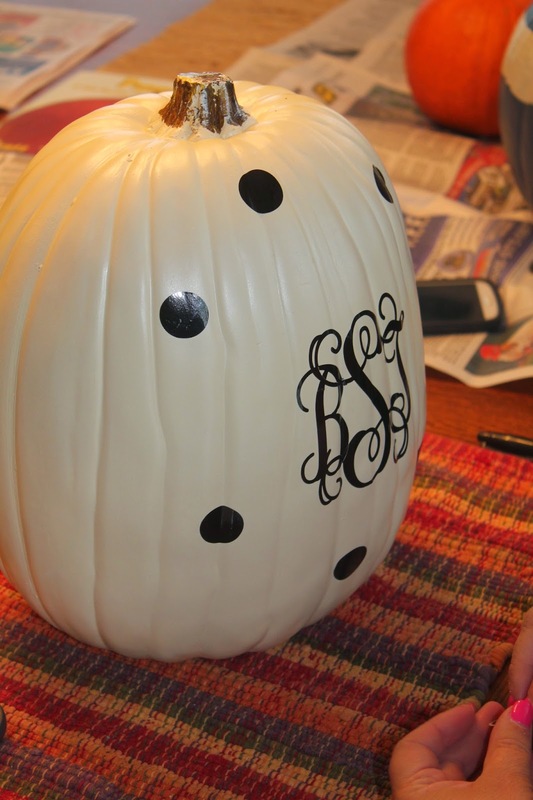 I had purchased a pumpkin at Michaels on sale to put polka dots and a monogram on. It was for inside the house. Too cute. Had a wonderful time with neighbors. Such a great group of people. How fun!! Love all of the goodies and the pumpkin you made! !